Fantastic photo taken by a camera trap somewhere in Asturias by the wildlife group FAPAS. 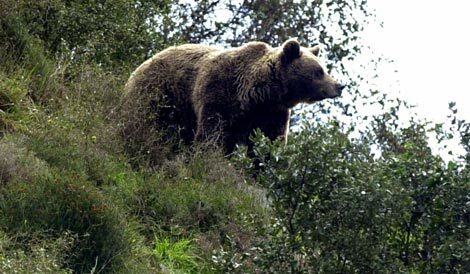 There are now some 180 brown bears in the Cantabrian mountains (Cantabria, Castilla y León and above all Asturias), triple the figure 20 years ago. December 5th, 2009	 A “new” reproductive female bear with two cubs has been found in Palencia, part of the beleaguered Eastern Cantabrian bear population. With only 30 odd individuals, this population is in a critical state, with at the last count, only two breeding females. In 2008 three cubs were born to the two females only one of which survived, one having been lost to infanticide and the other dying from unknown causes. This discovery of a third female and her two cubs of this year is raises hope for the bears’ future in this region. From Lisa on PicosdeEuropa and originally from nortecastilla.es. (above photo with bear and cubs). This autumn have may been a good one for Cantabrian bears thanks to the mild conditions and plentiful fruit. November 26th, 2009	 My friend Lisa who used to write the bear news on iberianature has finally brought on line her long-awaited Picos de Europa guide. This looks likely to become the English-language guide to those stunning mountains. There’s lots of interesting nature stuff on the web including Poison, Palencia and Picos and Return of the Lammergeier. 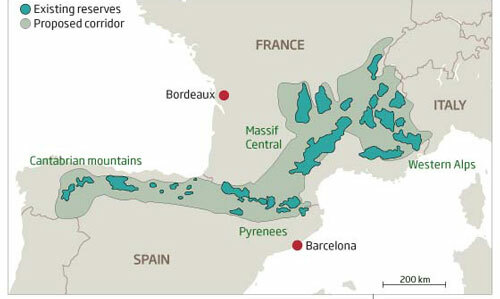 The Great Mountain Corridor is an idea to create a vast ecological corridor connecting the Cantabrian Mountains, the Pyrenees and the Alps, and possibly eventually, the Balkans, along which wolves, bears and other animals could roam relatively unhindered. Many thanks to Lisa on the forum for letting me know about this news, which is key to guaranteeing genetic diversity for Cantabrian bears, whose twin populations were separated more than 60 years ago. 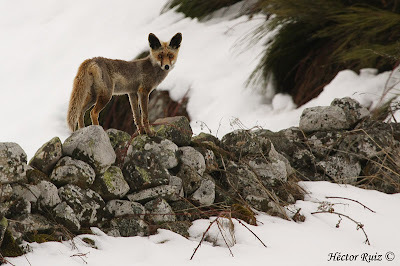 July 15th, 2009	 One of my favourite Spanish nature blogs is Zona Osera (Bear Zone) written by Hector Ruiz from the Valle de Laciana, León. Superb photography and great natural history writing.